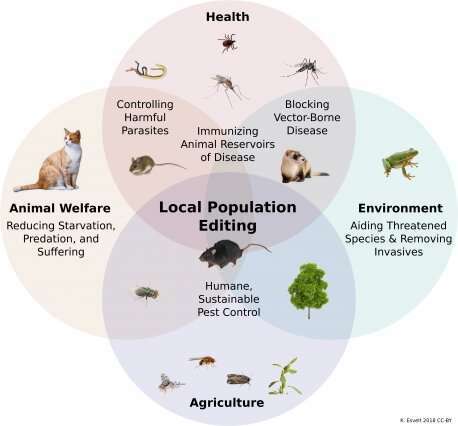 However, previously described versions of gene drives based on the CRISPR genome editing system have the potential to spread far wider than their intended local population—to affect an entire species. The affects could also spread across international boundaries, potentially leading to disputes between countries where no prior agreement had been made. "Imagine you have a chain of daisies, and at each generation you remove the one on the end. When you run out, the daisy chain drive stops," Esvelt explains. "We're programming the organism to do CRISPR genome editing on its own, within its reproductive cells, in each generation," Esvelt says. "If the world is to benefit from new gene-drive technologies, we need to be very confident that we can reverse it and contain it, both theoretically and via controlled tests," Church says. 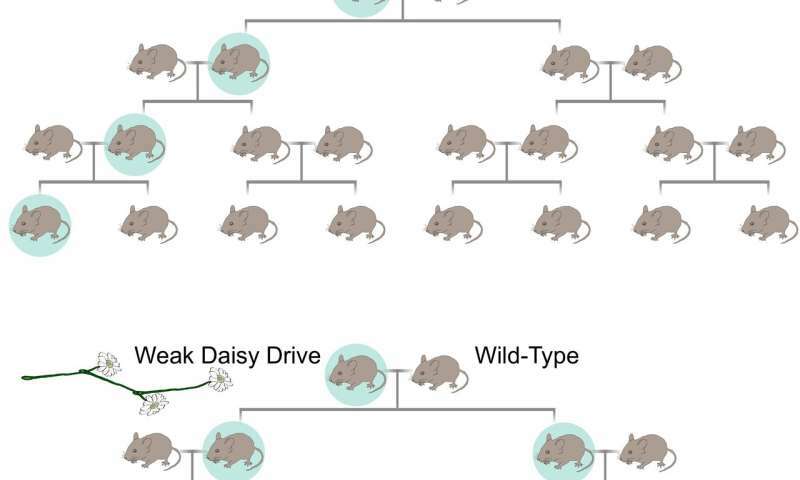 "Many of the applications of gene drives involve islands and other geographical isolations, at least for initial tests, including invasive species and Lyme disease," he noted. "It would be great if these highly motivated local governments can do tests that do not automatically affect adjacent islands or mainlands. The daisy-chain drives offer this." The research suggests that for every 100 wild counterpart, releasing just one engineered organism with a weak 3-link daisy-drive system, once per generation, should be enough to edit the entire population in about two generations—roughly a year in a fast-reproducing insect. 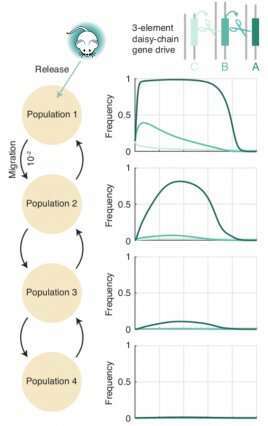 That compares with existing systems that must release at least as many organisms as are already present in a local population, and sometimes 10 or 100 times as many. In 2014, Esvelt and his colleagues first suggested that CRISPR-Cas9 could be used in gene-drive systems, and he has felt a moral responsibility to develop an alternative to self-propagating systems, he says. "Ideally, localization will let each community make decisions about its own environment, without forcing those decsions on others. According to Professor Luke Alphey, head of arthropod genetics at The Pirbright Institute in the UK, self-propagating drive systems can spread rapidly through target populations. However, such drive systems are also thought likely to spread to all connected populations of the target species—which is desirable if you want to modify the entire species, undesirable if you do not, he says. 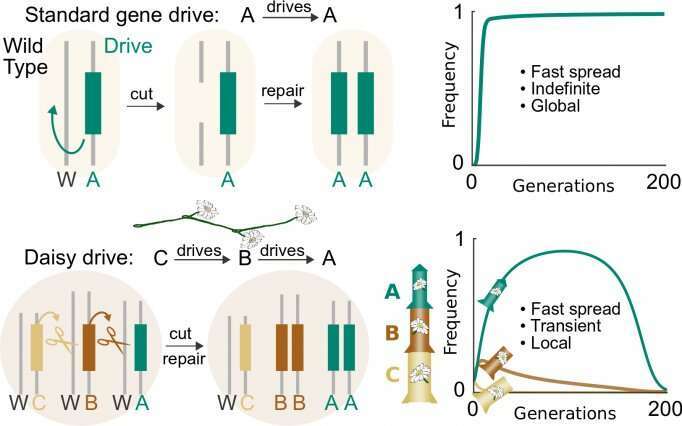 "Daisy-drives potentially provide a means to get much of the benefit of this type of gene drive, while constraining spread and also limiting persistence of the gene drive even in the target population," Alphey says. "That is likely to be highly desirable when one wants to affect one population but not another of the same species, perhaps affecting an invasive pest population but not populations of the same species in its native range."